Tea Party Leader Demanding Congress Sign Petition to repeal Obamacare! Tea Party Rising Again? Repeal of Obamacare, read more below and see what YOU can do! Obamacare, tax reform, and other topics have become partisan fights. Mr. Quagliaroli challenges citizens to move beyond partisanship and demand results from Congress. Citizens should demand that action be taken by elected officials. 2. All it takes is for 218 members of the House to sign the petition to force a vote on repealing Obamacare. 3. NINE out of the ten Republicans in Georgia joined the Democrats and have so far refused to sign on to the petition that would make a vote repealing Obamacare possible. 4. This is a petition, it does not expire. There is no set date to sign it, your member of can sign it any day of the week. 5. For details and to find out (1) what you can do and (2) to find out if your congressman was one of the ones who betrayed you,and refused to sign the petition, see information below and the attached documents from FreedomWorks. THE POLITICIANS THINK WE ARE STUPID, LET’S PROVE THEM WRONG AND CALL! CALL YOUR CONGRESSMAN-I am told they are falling off their chairs laughing because they received so few calls on this. Republicans do not know how to fight, but they do know how to count, and count calls they do. THESE REPUBLICANS NEED TO GET 100’s of calls, because to them, no calls means no action is needed, and many calls means…the natives are restless, we better do something. Right now they’re not at all worried about going back on their word and are more concerned with heat from leadership than from back home. ONE LAST THOUGHT-Repealing Obamacare is the ONE THING they all promised to do…over and over again. IF WE LET THEM GET AWAY WITH THIS, they will never listen to another word we say…why should they? It will be confirmation that we really are, TOO STUPID to stop them from doing anything they want, as long as they just tell us what we want to hear and give us a little pat on the head when they are back in the district. WERE YOU BETRAYED? To find out if your congressman signed the petition and is serious about repealing Obamacare, check the list on Congressman Garrett’s website (item# 3). 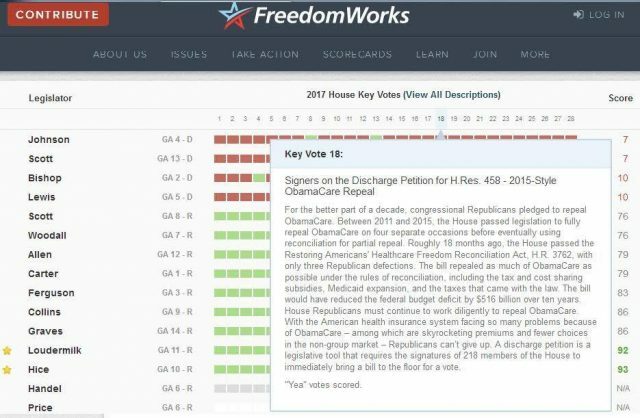 and while the first two documents shown here, (items 1&2) refer to actions of Georgia congressman, you can go to the FreedomWorks website and pull up your state if you don’t live in Georgia. 3. Call your member of congress THIS WEEK. All you have to say is; Did so & so sign on to the petition, if not, ask them to please do. Remember, you will most likely be talking to a 20 year old intern so be polite. Here is a list of the phone # to call if you are if you are in Georgia (it’s best to call their Washington Office where they count the calls…They each need to get 100’s of calls. P.S. Knowledge is NOT power…if you don’t act on it. Just knowing about the betrayal by your congressman will not do anything about it, you have to act on it and CALL THIS WEEK! They think we are stupid, lets prove them wrong! I, PERSONALLY AM MAD AS HELL AND NOT GOING TO TAKE IT ANYMORE. 1. I was paying $362.91 per month for great health insurance in 2008. 4. I was just notified that my current healthcare insurance company was pulling out of the market. It was the 3rd company in 3 years that I have had. I now have to look for my 4th health insurance company in 4 years and God only knows what I will have to pay for insurance for my family. #3. 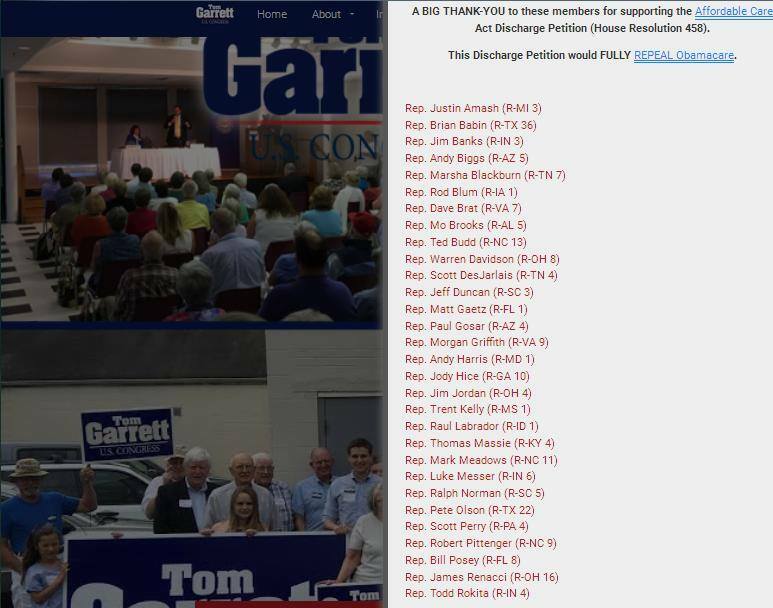 The Home Page of Congressman Tom Garrett from Virginia, listing all those who did sign the petition and thanking them for signing on to vote to repeat Obamacare. THE ABOVE INFORMATION is difficult to obtain. I spent a half day digging it out. The petition was not voted on on the house floor, so you can not Google it, or find it on all the watchdog group pages that have scorecards, because they only track votes. For that reason, I am sure that is why many in Congress have not signed the petition. This is an obscure procedure that is not recorded by Congress so I’m sure they felt YOU AND I WOULD NEVER KNOW ABOUT IT! This information is accurate as of Oct 23, 2017. 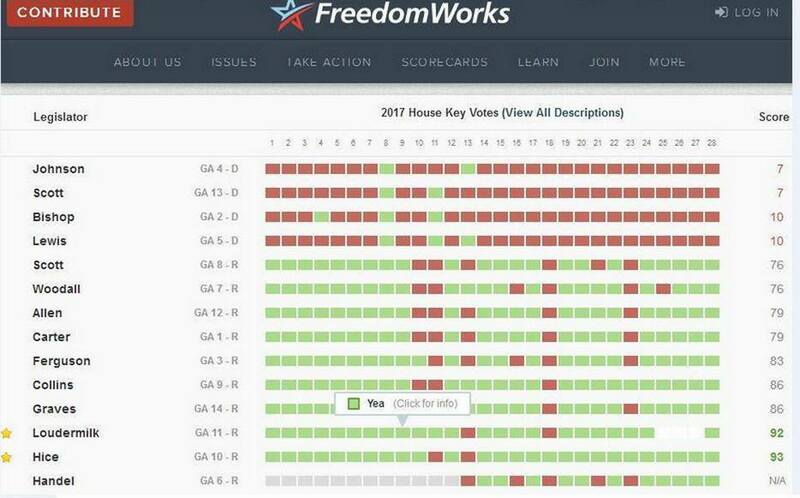 Both the FreedomWorks and Congressman’s websites report the actions (or lack of action) on the part of the Georgia Republican Delegation and verify each other. If you will lean on your congressman, together, we can get more of them to do what we sent them there to do, and what they SAID THEY WOULD DO….REPEAL OBAMACARE! IF YOUR CONGRESSMAN’S NAME IS NOT ON CONGRESSMAN GARRETT’S LIST. OR LISTED AS A NO, ON THE FREEDOMWORKS SCORECARD, CALL THEIR OFFICE this week and ask them to sign on to the petition to force a vote on Obamacare repeal in the House. This will give us a 2nd bite at the apple in the House. MAKE THEM VOTE-They voted on this in the Senate and now we know who the 7 liars are in the Senate, a vote in the House will flush out the liars in the House that need to be replaced. We will then know who the liars and saboteurs are in both the House and the Senate who are causing us to suffer under Obamacare. “This is an effort by House conservatives to force a vote on the bill most already supported before, but also to get members on the record for or against clean repeal,” House Freedom Caucus spokeswoman Alyssa Farah told the Washington Examiner. The House Freedom Caucus made the move after the Senate failed to pass the repeal-only aspect of the bill last month, despite similar legislation passing in 2015.